The adult division of the 2016 Midwinter Art Contest had a large number of fantastic works from around the world. We received entries from Australia, Hungary, several locations in the United Kingdom, and throughout the United States. All were wonderful, and the judges had a very hard time choosing between them. 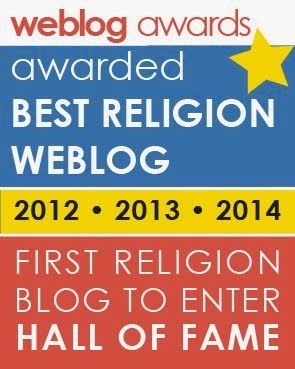 Congratulations to all who entered! The five winning artists created very unique and original works of art. I look forward to their future work and hope they continue to engage with Norse mythology as a spur to their creativity! 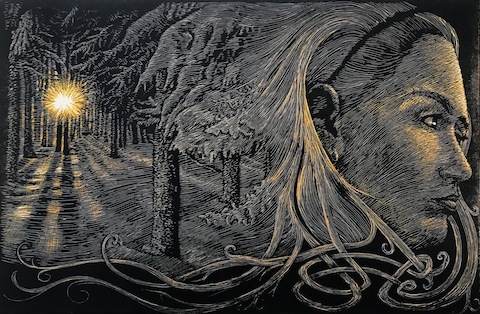 This woodcut (Freyja and the North Wind) represents the dual nature of the spiritual and nature. In this piece, the nature and serenity of Freyja and my impression of what midwinter represents to me. My daughter modeled as Freyja for me. I studied the color of light and shadows outside the studio as the sun sets earlier and earlier each day, becoming more and more saturated as the angle of the sun became more oblique approaching midwinter. All three judges voted this piece in first place. It's a truly powerful work, and Chad completely deserves the win for such a beautiful creation. Rufus writes, "I absolutely love this piece by Chad! It is a very considered and well-balanced composition and is masterfully executed. I love the light coming through the trees and reflective light on Freya's face. In its simplicity, it shows how much can be achieved in a monochromatic piece. It is a joy to behold!" Diana adds, "Excellent presentation of the quality of midwinter light. The blending of hair and foliage is beautifully done. Her meditative expression is also very appropriate. Fold this in half and you would have a very nice Yule card." 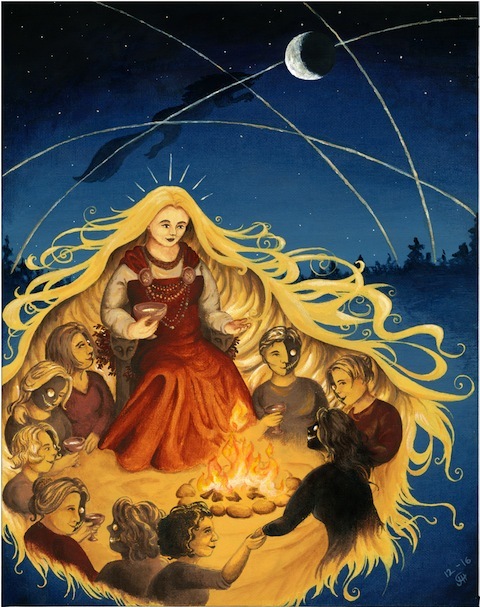 A fire burns in the hall under the stars, where Freyja celebrates midwinter. In her height of power at this crucial moment, she rejects grand displays of power and chooses instead to share her energy for life and growth and love in celebration with the women who came to her when they died. Welcoming all newcomers to their hearth, they sing, exchange stories, share food and laughter, delight in their differences and rejoice in their similarities. Around them, the heavens are still in motion; the sun, unseen, poised on the brink of change, the wolf chasing the moon on its longest journey of the year. But by sharing their love for each other, for their world and for themselves, Freyja and her companions create a circle of hope, generosity and understanding, enough to transcend time and distance, and spread light and warmth throughout the world. Amazing! I love this piece. The thought and execution are both transcendent and moving. Diana says, "Beautiful use of color. The night sky is rendered with great subtlety. The wolf is a good touch. Making Freyja’s hair the protective enclosure is very effective." Rufus writes, "Julia's piece of art has a beautiful warmth, and the clever way the women are depicted as living/dead is a lot of fun! The arcs in the sky and semicircular group of figures offset with the moon pulls the picture together to great effect." In my submission, I chose to depict Freyja as the magical queen of the winter season. 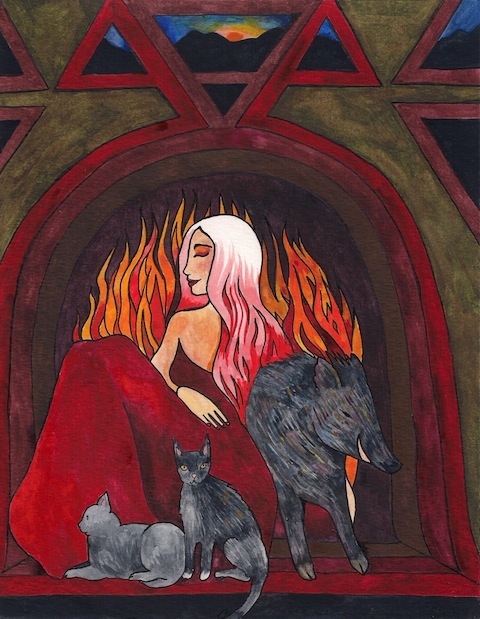 In my painting, Freyja is ridding on her boar Hildisvíni and is flanked by her two cat totems. Behind her head, I put the symbol of wyrd. In her right hand, I put a wintry scepter, showcasing her connections with magic. A parade of elves accompany her as they work to bring in the winter season. 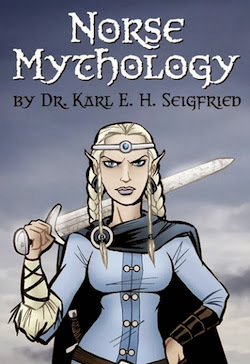 From my many studies of Germanic mythology, I always found the relationship between the elves and the Vanir very interesting, the distinction between the two races graying at times. I chose to represent this relationship by giving Freyja the elvish ear trope to suggesting that the Vanir and the elves could be the same race, the Vanir being a group of ruling aristocrats to the elves. I really like this piece. It shows a looseness of creative freedom with the source materials while presenting a strong and graceful image. Great! Rufus writes, "Andrew's piece is gorgeously painted and playful, with the boar Hildisvíni looking out at the viewer and Freyja ethereally looking straight ahead. It's a wonderful fantasy piece!" Diana comments, "The drawing is excellent, as is the use of stylization and design elements and color. Your interpretation of the relationship between the Vanir and the elves is interesting. I wouldn’t say they are the same race, but certainly they are connected." In the serene darkness of midwinter, the goddess of magic, love, and war takes a break from her endeavors to drowse beside a roaring fire in the secure sanctuary of her hall. Freyja is joined by her two cats, who are happy to have a holiday from pulling her chariot. 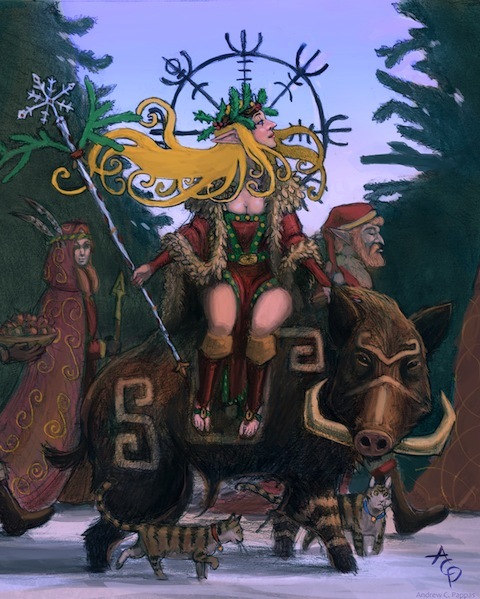 She reclines against the bulk of her steadfast companion, Hildisvíni, the boar itself a traditional symbol of the solstice celebration. In the soporific glow of the fire, Freyja dreams of the events of the coming year. Through the windows above the hearth, the first rays of the newborn sun are seen emerging over the mountains on the horizon, signifying the waxing of the light of day and the imminent return of plant and animal life to the earth after the cold desolation of winter. This has such a great graphic design and strong composition. I love the choice of color palette to emphasize the warmth of the fire, rather than the cold of midwinter. Brilliant! Diana writes, "Good portrait of Freyja as Love’s fire. This would make a good Yule card." Rufus comments, "A lovely warm composition to help us all through the dark nights! I love the sun peaking through, heralding the approaching spring and rebirth, even in the darkest of times. This piece warms the heart and the hearth!" This pencil and watercolor offering is my most heartfelt “thank you” to Freyja. Twenty years ago this past fall, I was gifted her name by an elder in my first spiritual circle and our relationship since has been rich, real, and intense. Technically, I chose the feminine circular frame to represent one day. The line of darkness literally shows how much time Chicago will be in darkness this Winter Solstice. As an “unseen” spiritual force in my life, I chose Freyja's eyes to be watching from this darkness, but with their own unclouded connection. The moon above is the phase the moon will be in on December 21st as well. She is wearing Brísingamen, of course, but strung with four golden bands to represent her relations with the dwarves. Fólkvangr is the mountain rising up from the fields behind her. Spiritually, my tribute is woven into her hair where I have written in the Anglo-Frisian futhorc (as it phonetically transliterates to English the best) the most magically powerful moments of my life. Along with the cursory "Stephanie Lynn was here Ha Ha Ha" and a tribute to my four most “treasure bearing lovers.” Long live the Lady! Wow! I love how much feeling, wisdom, and thought Stephanie put into this image. It's a truly haunting work of art and expresses aspects of both the goddess and the season in an absolutely unique way. Diana writes, "Delicate and precise. I really like the use of runes." 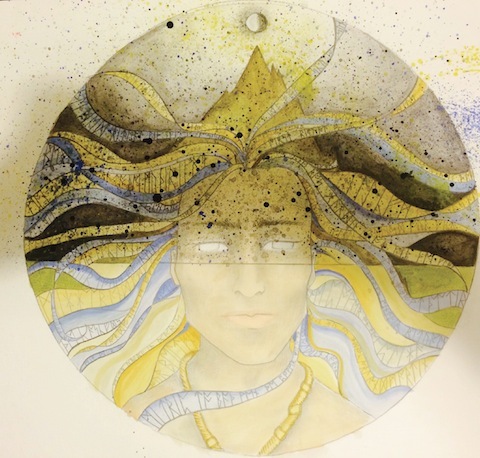 Rufus comments, "With the runic devices and use of duality within the circular form, Stephanie's piece very intelligently demonstrates both the balance of the natural and the spiritual realms." Thank you to all the kids, teens and adults who entered this winter. We really enjoyed everyone's work. See you when the next contest rolls around!